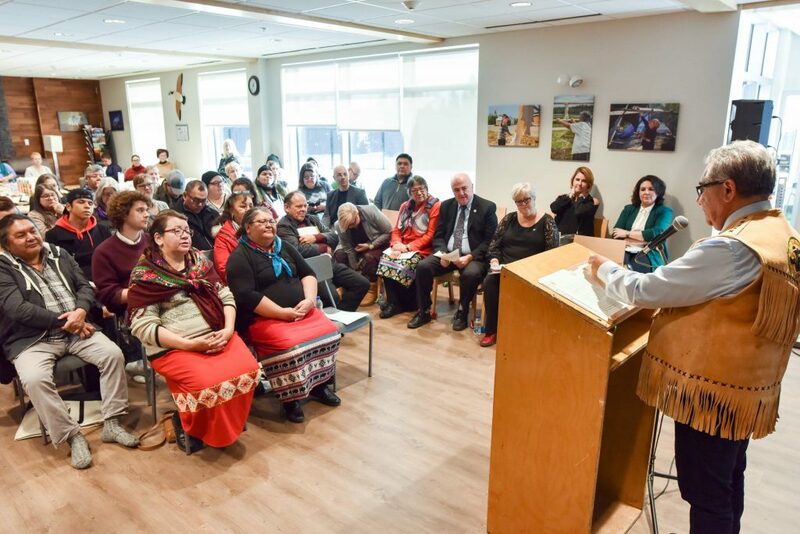 There was a veritable buzz in the air at the inauguration of Piipiichaau Uchishtuun (Robin’s Nest), the new woman’s shelter in Waskaganish, which will bring culturally sensitive social services to women in coastal communities. Spearheaded by Virginia Wabano, with support from the Cree Women of Eeyou Istchee Association (CWEIA), the Cree Board of Health and Social Services of James Bay (CBHSJB) and funded by the Cree Nation Government, Robin’s Nest offers shelter for up to 18 women, including space for their children. Among the guests were Sylvie D’Amours, the recently appointed Indigenous Affairs Minister, and Ungava MNA Denis Lamothe, both from the new Coalition Avenir Québec government. Lamothe once worked as a police officer in Waskaganish and saw some familiar faces at the inauguration. The shelter’s architecture is modelled on its sister structure, also called Robin’s Nest, which opened last year in Waswanipi. The name comes from the Cree Legend of Ayaashaau, which Wabano movingly shared with guests – a tale of transformation, healing and ultimately, reconciliation. “Finally, our shelters are within our territory in our own language, incorporating our cultural values into healing programs,” she said. The building stands as a reminder that while the community is reaching out to its most vulnerable, the reality of domestic violence lurks amongst even the most tightly knit neighbourhoods. Previously, those facing abuse would have to seek out professional help in Val-d’Or or Montreal – often an impersonal and expensive ordeal. Marti Miller, the clinical coordinator at the Native Women’s Shelter of Montreal, shared her experience of learning the hard way about how the city’s aging facilities could have been better designed. The Montreal shelter can only offer limited support and short-term stays for those coming from the north. As well, language and cultural barriers make it hard to help victims. For those with dependents, travelling hundreds of miles to seek refuge can have an entirely different impact. “Imagine having to take your children out of school, out of home – even just that can be an isolating and traumatic experience for them,” Miller said. For longer stays, this can lead to children falling behind in school, or not being able to see their friends and family. At Robin’s Nest, children can still attend their classes while mothers get the assistance they need. For victims of domestic abuse, seeking shelter out of town was a last resort and the violence they were escaping from was often waiting for them upon their return. “You can’t just remove women for a bit and expect the system to change – this shelter will be able to offer a more holistic approach to care, taking into consideration the kinds of support structures that are needed well after the stay,” said Miller. In practice, this ranges from helping victims and their families access further services, such as caseworkers, medical assistance or guidance after a traumatic violent experience. For Grand Chief Abel Bosum, this is the natural next step in the larger plan to provide Crees with the tools they need to take care of their own. The CBHSSJB will soon have a long-term operational budget to ensure the shelter is staffed with well-trained women from around Eeyou Istchee. That way, the shelter can become a part of the community, instead of simply serving it. “This is part of a bigger plan, including infrastructure, social services, and next steps to further empower women,” said Bosum. Projects like Robin’s Nest not only offer shelter to those who need it, they also signal that victims do not need to suffer in silence – and that help is only a phone call away.